Similar to other industries, the process of developing as a professional is an enduring one, with lots of twists and unexpected turns, but those of us in this niche venue management industry have to start at square 1. Some may be more fortunate than others where square 1 could be a mid-level manager position but we all add value to our respected departments within our venues and had to start somewhere. Like most, square 1 for me was seeking part-time jobs, internships, and volunteer opportunities that would give me the necessary experience and prepare me for my first full-time job. While still being “green” in the industry and solidifying my first full-time gig, I looked into IAVM and sought out a career development program where I could grow as a venue professional and hone my skill set that would allow me to be successful. Starting out in operations, I was eager to broaden my knowledge base, develop a personal brand, and learn about different aspects of the industry, especially on the booking side. To quench my thirst for this endeavor, I sought out a career development program in the Mentor Connector Program, a one-on-one, 12-month partnership where mentees develop and expand on their professional network, seek out a range of career opportunities, and identify specific goals to accomplish throughout the program with their mentor. A couple ways I was able to accomplish these objectives, while creating some long-lasting friendships, was attending my first VenueConnect as part of the inaugural 30-Under-30 Class in Baltimore of 2015, and being one of the Class Representatives at IAVM’s Venue Management School the summer of 2017–2018. While this may seem generic or cliché, this piece of advice has resonated within me and will continue to fuel the fire I have for this industry. Today, I still talk each of my mentors and often conduct informational interviews with industry professionals I have met along the way. So far, my journey has opened a window of opportunities that I would have never envisioned when I started out, and I have been grateful to have received some recognition and accolades through the IAVM Foundation. My involvement with IAVM all started by seeking out a mentorship through the Mentor Connector Program, and I will continue to give back to the program that ignited my professional development. If you are interested in learning more about IAVM’s Mentor Connector Program, check our webpage (https://www.iavm.org/mentor-connector-program) and be sure to tune in to our Mentoring Connector Webinar on Thursday, September 27 at 12:30pm PST/3:30pm EST. You may just impact the life of some-“green”-venue-professional and enhance your contribution to the industry. 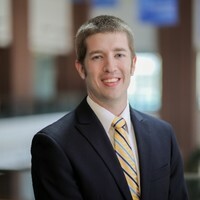 Andrew Shreve is the acting Vice Chair of the Young Professionals Committee and serves on the Mentoring Committee.